But a century into our love affair with plastic, we’re starting to realize it’s not such a healthy one. Plastics draw on dwindling fossil fuels, leach harmful chemicals, litter landscapes, and destroy marine life. And yet each year we use and consume more; we’ve produced as much plastic in the past decade as we did in the entire twentieth century. We’re trapped in an unhealthy dependence – a toxic relationship. Journalist Susan Freinkel shows in this engaging and eye-opening book that we have reached a crisis point. 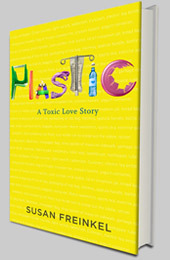 Freinkel treks through history, science and the global economy to assess the real impact of plastic in our lives. She tells her story through eight familiar plastic objects: the comb, chair, Frisbee, IV bag, disposable lighter, grocery bag, soda bottle, and credit card. Each one illuminates a different facet of our synthetic world, and together they give us a new way of thinking about a substance that has become the defining medium—and metaphor—of our age. Freinkel’s conclusion? We cannot stay on our plastic-paved path. And we don’t have to. Plastic points the way toward a new creative partnership with the material we love to hate but can’t seem to live without. "Freinkel's smart, well-written analysis of this love-hate relationship is likely to make plastic lovers take pause, plastic haters reluctantly realize its value, and all of us understand the importance of individual action, political will, and technological innovation in weaning us off our addiction to synthetics."